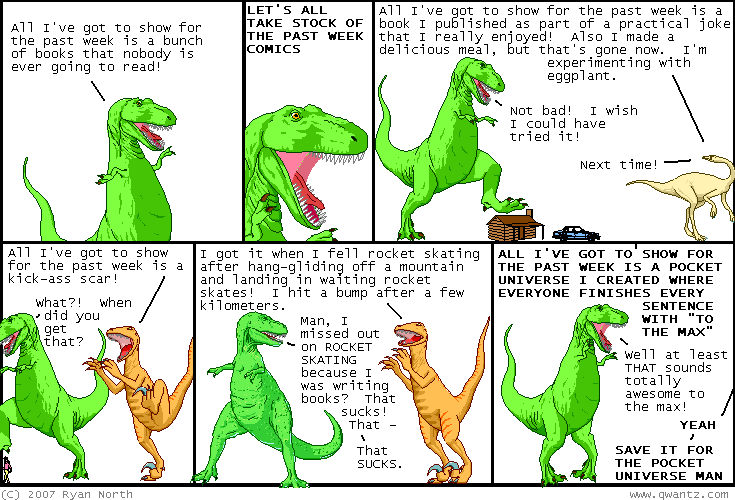 Dinosaur Comics - November 9th, 2007 - awesome fun times! ALSO you might remember Yahtzee's website, Fully Ramblomatic. I linked to it a few years ago when I was recommending his most excellent adventure games, particularly 5 Days A Stranger. And I'm just seeing now that there's 2 sequels to that game that I didn't know about! NICE. Anyway Yahtzee's also started doing video games reviews called Zero Punctuation that are sharp and witty and it's been great that no fewer than four friends have recommend them to me, because I get to say "Oh man, sweet! And his adventure games are great too!". The review of Bioshock is inspired. So there are some entertainment recommendations for you! From me, Ryan, a Guy with a Website!